With more than 50,000 extension agents, Ethiopia seemed like the ideal country in which to expand our efforts. And it was — since beginning our work in Ethiopia in 2011, the country has proven fertile ground for partnerships and projects related to agriculture and health. Digital Green works closely with Ethiopia’s Ministry of Agriculture and Natural Resources at the national, regional, woreda (district) and kebele (clustered village) levels. 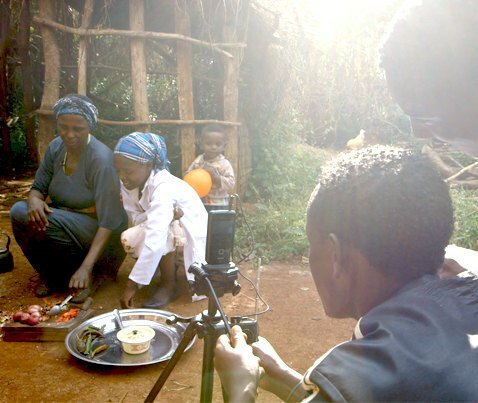 At the woreda level, we build the capacity of subject-matter specialists to produce localized videos. 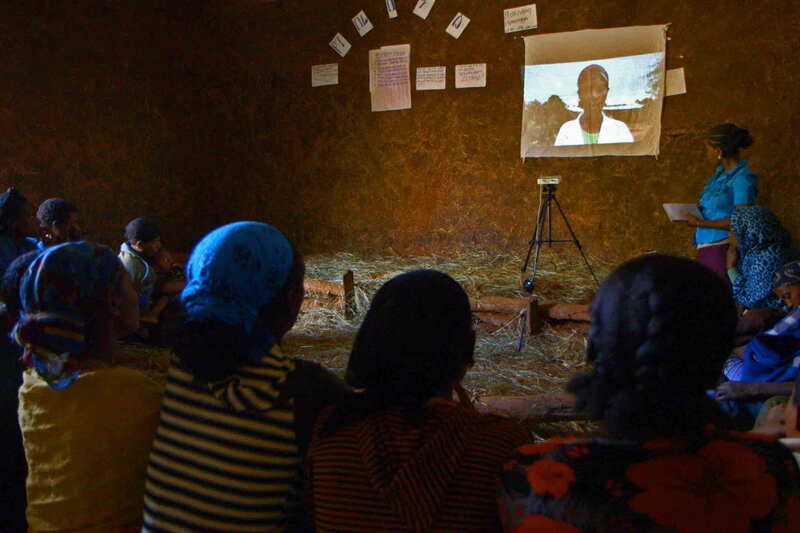 At the kebele level, we train public extension officers to screen those videos among their communities. Digital Green is building a knowledge exchange platform that links researchers, extension agents, and farmers across the country. By working across multiple media channels (including video, radio, mobile) that smallholder farmers have access to, we provide greater depth of information on topics from agronomic practices to nutrition behaviors. Many poor, smallholder farmers lack access to quality agricultural tools that can help them increase farm yields. By partnering with organizations that produce and distribute tools like bio-fertilizers and improved seeds, we are spurring their demand and facilitating their supply. These inputs can play a unique role in boosting staple crop production and increasing food security. Livelihoods for Resilience is implemented by a consortium of five partners under the leadership of CARE with a total budget of US$ 48 million. The goal of of the project is to reduce food insecurity and increase resilience for households in 27 PSNP woredas of Amhara, SNNPR, and Tigray. Digital Green promotes adoption of improved agricultural technologies and practices, nutrition practices, and gender norms through its video-based extension approach. Leveraging peer-to-peer learning, Digital Green trains community members to facilitate participatory video screenings and discussions with VESAs. Video content focuses on improved agricultural practices and technologies (including post-harvest and value addition technologies) for targeted value chains, with nutrition-related content woven throughout. Video content, format, and dissemination modalities are accessible to women farmers. 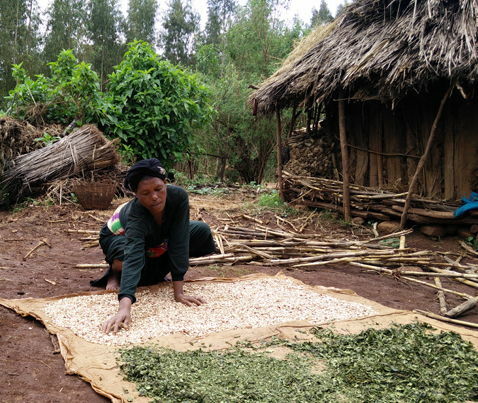 Through a grant from the Packard Foundation, Digital Green is working to integrate conservation agriculture, sustainability and natural resource management (NRM) practices into Ethiopia’s public agricultural extension services. Building on our work to institutionalize the video-enabled extension approach, Digital Green is working with Ethiopia’s Ministry of Agriculture and Livestock Agriculture Extension Directorate to develop and layer NRM-focused content with video. The project is: 1) developing DAs’ capacity to produce and disseminate videos that demonstrate key NRM practices and their livelihood benefits; 2) developing a DA-level curriculum that integrates conservation and NRM with agricultural productivity; and 3) exploring leveraging IVR to reinforce NRM messages. In 2011, Digital Green forged a partnership with the national extension system operated by Ethiopia’s Ministry of Agriculture and Natural Resources. We introduced a method for message delivery that is cost effective, locally relevant for farmers, and reaches both men and women. Our common goal is to raise incomes and increase food security of smallholder farming communities by increasing their adoption of sustainable agricultural practices. With integrated use of ICTs, DAs are reaching more farmers with accurate, timely, effective and localized messages. ICTs bring information directly to farmers rather than requiring farmers to travel. Since 2011, we have reached 278,843 farmers, nearly 50% of who adopted featured practices. By fully incorporating end-to-end institutionalization of our video-enabled extension approach within the national extension structure, broadening the extension system’s capacity to train larger numbers of extension agents, and continuing to test complementary information and communication technologies that improve extension and market access, Digital Green will help the national extension structure to reach 6.7 million farmers by 2021. Digital Green and its consortium partners, Awaaz.De, Dimagi, and Farm Radio International, are working across an integrated set of media channels – video, radio, and interactive voice response – to reach over one million smallholder farmers with in-depth information on farming practices specific to Ethiopia’s priority crops: teff, wheat, maize, barley, sesame and chickpea. Working closely with the Government of Ethiopia’s Ministry of Agriculture and Natural Resources and regional bureaus of agriculture in four regions, Digital Green is accelerating the number of new farmers adopting agricultural technologies and related practices promoted under the New Alliance Scaling Seeds and Technologies Partnership.